Prof. David Jordan is a sorghum breeder and geneticist with more than 20 years experience working in both the public and private sector. 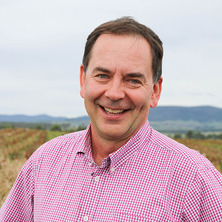 For the last decade he has led the public sorghum pre-breeding program in Australia which is a partnership between the University of Queensland (UQ), The Queensland Department of Agriculture and Fisheries (DAF) and the Grains research and Develop Corporation (GRDC). This is a long running and successful research effort with a reputation for integrating across disciplines and linking research efforts from the strategic to the applied. Breeding lines from this program are widely used commercially in Australia and internationally with 100% of the commercial sorghum grown in Australia having genetics from the program. At the same time the research group continues to produce research papers at the forefront of sorghum research. In recent years he had led projects focused on improving the lives of resource poor farmers in Africa that rely on sorghum. Hammer, G. L. and Jordan, D. R. (2007). An intergrated systems approach to crop improvement. In J.H.J. Spiertz, P.C. Struik and H.H. van Laar (Ed. ), Scale and complexity in plant systems research : Gene-plant-crop relations (pp. 45-61) The Netherlands: Springer. Borrell, Andrew, Jordan, David, Mullet, John, Henzell, Bob and Hammer, Graeme (2006). Drought adaptation in sorghum. In Jean-Marcel Ribot (Ed. ), Drought adaptation in cereals (pp. 335-399) New York, U.S.A.: The Haworth Press. An overview of the biology of sorghum ergot. Bhuiyan, S., Henzell, R. G., Herde, D. J., Jordan, D. and Ryley, M. J. (2003). An overview of the biology of sorghum ergot.. In Sorghum and Millets Diseases (pp. 141-150) USA: Iowa State Press, Blackwell Publishing. Molecular mapping and candidate gene identification of the Rf2 gene for pollen fertility restoration in sorghum (Sorghum bicolor (L.) Moench). Tao, YZ, Jordan, DR, Henzell, RG and McIntyre, CL (1998) Construction of a genetic map in a sorghum recombinant inbred line using probes from different sources and its comparison with other sorghum maps (vol 49, pg 729, 1998). Australian Journal of Agricultural Research, 49 5: U1-U1. Borrell, A. K., George-Jaeggli, B., van Oosterom, E. J., Mace, E. S., Jordan, D. R., Kassahun, B., Matiwos, T., Vadez, V., Talwar, H., Christopher, J. T., Chenu, K., Richard, C., Robinson, H., Hickey, L., Nagothu, S. U. and Hammer, G. L. (2017). Adapting cereals to drought: genetic and management solutions. In: Trop Ag 2017 Book of poster abstracts. TropAg2017, International Tropical Agriculture Conference, Brisbane, Australia, (123-123). 20-22 November 2017. Chapman, S., Zheng, B., dreccer, F., Hammer, G., Jordan, D. and Chenu, K. (2016). Integration of crop models into breeding programs. In: International Crop Modelling Symposium, Berlin, Germany, (). 15-17 March 2016. Borrell, v, Van Oosterom, Erik J., Mullet, John, George-Jaeggli, Barbara, Hammer, Graeme, Klein, Patricia and Jordan, David (2014). The stay-green trait in cereals: integrating from cell to whole plant. In: 7th European Workshop on Plant Senescence, Aarhus, Denmark, (). 10-14 November 2014. Development and evaluation of drought-adapted sorghum germplasm for Africa and Australia – Phase II. Borrell, A., Coulibaly, S., Teme, N., George-Jaeggli, B., Hamlet, S., George, P. and Jordan, D. (2013). Development and evaluation of drought-adapted sorghum germplasm for Africa and Australia – Phase II.. In: Proceedings of the 2013 Generation Challenge Program Annual Research Meeting. 2013 General Research Meeting (GRM), Lisbon, Portugal, (). 27 - 30 September 2013. Improving cereal productivity with stay-green technology. Borrell, A., Hammer, G., Van Oosterom, E., George-Jaeggli, B., McLean, G., Hamlet, S., Hunt, C., Mace, E., Mullet, J., Klein, P., Weers, B. and Jordan, D. (2013). Improving cereal productivity with stay-green technology.. In: 2013 QAAFI Annual Research Meeting, Brisbane, Australia, (). 6-7 August 2013. Singh, V., van Oosterom, E. J., Jordan, D. R., Mace, E., Colleen, H. and Hammer, G. L. (2013). Nodal root angle in Sorghum and its association with drought adaptation. In: 30th Interdisciplinary Plant Group Symposium, Columbia Missouri, United States, (). 29 - 31 May 2013. Jordan, David (2013). Riding the climate rollercoaster: an integrated approach to sorghum improvement in Australia. In: ID4: InterDrought-IV Conference 2013. The 4th International Conference on Integrated Approaches to Improve Crop Production under Drought-Prone Environments, Burswood, WA, Australia, (). 2-6 September, 2013. Jordan, D., Mace, E. and Borrell, A. (2013). Sorghum crop improvement in Australia: integrating breeding, genomics, physiology, molecular biology, bioinformatics, and simulation modelling. In: Proceedings of the 2013 Annual Meeting of the Sorghum Research Institute, Liaoning Academy of Agricultural Science. 2013 Annual Meeting of the Sorghum Research Institute, Liaoning Academy of Agricultural Science, Shenyang, China, (). 28-30 January, 2013. Borrell, Andrew K., Jordan, David R. and George-Jaeggli, Barbara (2011). Developing drought-adapted sorghum germplasm for Africa and Australia: Stay-green trait beneficial in tall and short backgrounds. In: Plant and Animal Genome XIX Conference. Plant and Animal Genome XIX Conference, San Diego CA, United States, (). 15-19 January 2011. Borrell, Andrew, Paterson, Andrew H., Hash, C. Tom, Billot, Claire, Jordan, David R., Lespinasse, Denis, Weltzien, Eva, Rattunde, H. Fred W., Upadhyaya, Hari D., Glaszmann, Jean-Christophe, Rami, Jean-Francois, Vaksmann, Michel, Teme, Niaba, Niangado, Oumar, Ramu, Punna, Senthilvel, S., Deshpande, Santosh P., Bouchet, Sophie and Kresovich, Stephen (2010). A GCP Challenge Initiative: Drought Tolerance Improvement for Sorghum in Africa. In: Abstracts for the Plant & Animal Genome XVIII Conference. Plant & Animal Genome XVIII Conference, San Diego, CA, U.S.A., (). 9-13 January 2010. Alam, M. M., Hammer, G. L., van Oosterom, E. J., Cruickshank, A. and Jordan, D. R. (2010). Exploring physiological and genetic determinants of tillering in sorghum. In: Proceedings of the 1st Australian Summer Grains Conference. 2010 Australian Summer Grains Conference, Gold Coast, Queensland, Australia, (). 21-24 June 2010. Singh, Vijaya, van Oosterom, Erik, Jordan, David, Mace, Emma and Hammer, Graeme (2010). Genetic control of root system architecture in sorghum and its implications on water extraction. In: J. Wery, I, Shili-Touzi and A. Perrin, Proceedings of Agro2010: The XIth ESA Congress. Agro2010 XIth ESA Congress, Montpellier, France, (553-554). 29 August - 3 September, 2010. Singh, Vijaya, van Oosterom, Erik, Jordan, David and Hammer, Graeme (2010). Genotypic variability for nodal root angle in sorghum and its implications on potential water extraction. In: Proceedings of the 1st Australian Summer Grains Conference. Australian Summer Grains Conference 2010, Gold Coast , Australia, (). 21-24 June 2010. Alam, M.M., Hammer, G.L., Van Oosterom, E.J., Cruickshank, A., Hunt, C. and Jordan, D.R. (2009). Characterising genetic variation in tillering in sorghum. In: SABRAO Journal of Breeding and Genetics. 14th Australasian Plant Breeding & 11th SABRAO Conference, Cairns, Australia, (). 10-14 August, 2009. Can large kernel size increase grain yield in sorghum? Yang, Zongjian, Hammer, Graeme, Van Oosterom, Erik, Jordan, David and Doherty, Alistair (2008). Can large kernel size increase grain yield in sorghum?. In: Global Issues, Paddock Action: Proceedings of the 14th Australian Society of Agronomy Conference. 14th Australian Society of Agronomy Conference, Adelaide, South Australia, (). 21-25 September 2008. Hammer, G. L. and Jordan, D. R. (2007). An integrated systems approach to crop improvement. In: J. H. J. Spiertz, P. C. Struik, H. H. van Laar and R. J. Bogers, Proceedings of the Frontis Workshop on Scale and Complexity in Plant Systems Research: Gene-Plant-Crop Relations. International Frontis Workshop 2006. Gene-Plant-Crop Relations: Scale and Complexity in Plant Systems Research, Wageningen, Netherlands, (45-61). 23-26 April 2006. Christopher, Mandy J., Mace, Emma, Jordan, David, Rodgers, David, McGowan, Paul, DeLacy, Ian H., Banks, Phillip M., Sheppard, John., Butler, David G. and Poulsen, David (2006). Applications of pedigree-based genome mapping in wheat and barley breeding programs. In: Advances in pasture plant breeding : Papers from the 13th Australasian Plant Breeding Conference. 13th Australasian Plant Breeding Conference, Christchurch, New Zealand, (). 18-21 April 2006. Jordan, D., Hammer, G. L. and Henzell, R. G. (2006). Breeding for yield in the DPI&F breeding program. In: A. K. Borrell and D. R. Jordan, 5th Australian Sorghum Conference. 5th Australian Sorghum Conference, Gold Coast, Qld, Australia, (1-8). 30 January - 2 February 2006. George-Jaeggli, B., Hammer, G. L., Van Oosterom, E. J. and Jordan, D. R. (2006). Tall sorghum plants use water more efficiently than short ones. In: Proceedings from the 5th Australian Sorghum Conference. 5th Australian Sorghum Conference, Gold Coast, (1-8). 30 January - 2 February 2006. Mullet, J., Klein, P., Klein, R., Rooney, B., Jordan, D., Borrell, A., Pratt, L., Cordonnier-Pratt, M. M., Price, D. S. J., Morishige, D., Menz, M., Buchanan, C., Salzman, R., Islam-Faridi, N., Harris, K., Brady, J., Kim, J. S., Lim, S. and Zhou, B. (2005). Sorghum and the genetic basis of drought tolerance. In: Annual Main Meeting of the Society for Experimental Biology, Barcelona, Spain, (S299-S299). 11-15 July 2005. Borrell, Andrew K., Jordan, David, Mullet, John, Klein, Patricia, Klein, Robert, Nguyen, Henry, Rosenow, Darrell, Hammer, Graeme, Douglas, Andrew and Henzell, Bob (2004). Discovering stay-green drought tolerance genes in sorghum: A multidisciplinary approach. In: T. Fischer, N. Turner, J. Angus, L. McIntyre, M. Robertson, A. Borrell and D. Lloyd, New Directions for a Diverse Planet: Proceedings of the 4th International Crop Science Congress. 4th International Crop Science Congress, Brisbane, Australia, (1-5). 26 September-1 October 2004. Is increased radiation use efficiency in sorghum related to increased height? George-Jaeggli, Barbara, Broad, Ian, Hammer, Graeme and Jordan, David (2004). Is increased radiation use efficiency in sorghum related to increased height?. In: T. Fischer, N. Turner, J. Angus, L. McIntyre, M. Robertson, A. Borrell and D. Lloyd, New Directions for a Diverse Planet: Proceedings of the 4th International Crop Science Congress. 4th International Crop Science Congress, Brisbane, Australia, (1-5). 26 September-1 October 2004. Borrell, A., Van Oosterom, E. J., Hammer, G. L., Jordan, D. and Douglas, A. (2003). The physiology of "stay-green" in sorghum. In: Australian Society of Agronomy, Proceedings of the 11th Australian Agronomy Conference. 11th Australian Agronomy Conference, Geelong, Victoria, (1-4). 2-6 February, 2003. Casu, R, Dimmock, C, Thomas, M, Bower, N, Knight, D, Grof, C, McIntyre, L, Jackson, P, Jordan, D, Whan, , Drenth, J, Tao, Y and Manners, J (2001). Genetic and expression profiling in sugarcane. In: Hogarth, DM, 24th Congress of the International-Society-of-Sugar-Cane-Technologists, Brisbane Australia, (542-546). Sep 17-21, 2001.